^ "Elgin Marbles – Greek sculpture". Encyclopædia Britannica. Retrieved 18 June 2018. ^ a b c d e f g h i j k l Casey, Christopher (30 October 2008). ""Grecian Grandeurs and the Rude Wasting of Old Time": Britain, the Elgin Marbles, and Post-Revolutionary Hellenism". Foundations. Volume III, Number 1. Archived from the original on 13 May 2009. Retrieved 25 June 2009. ^ a b c d e f King, Dorothy (21 July 2004). "Elgin Marbles: fact or fiction?". London: The Guardian. Retrieved 25 June 2009. 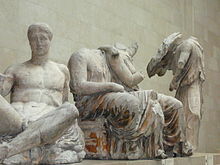 ^ Encyclopædia Britannica Online "Elgin Marbles". Encyclopædia Britannica. Retrieved 18 April 2011. 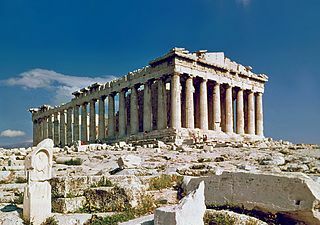 ^ "How the Parthenon Lost Its Marbles". 28 March 2017. Retrieved 24 April 2017. ^ a b c d "Romancing the Stones". Newsweek. Retrieved 25 June 2009. ^ a b "Museum admits 'scandal' of Elgin Marbles". BBC News Online. 1 December 1999. Retrieved 3 January 2010. ^ a b Kennedy, Maev (1 December 1999). "Mutual attacks mar Elgin Marbles debate". The Guardian. London. Retrieved 29 December 2008. ^ "Springer Proceedings in Physics". United States Geological Survey. 7 November 2005. Retrieved 20 January 2009. ^ "Preserving And Protecting Monuments". Springer Berlin Heidelberg. 14 August 2007. Archived from the original on 18 June 2009. Retrieved 25 June 2009. 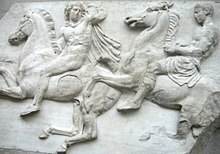 ^ "The Parthenon Marbles (or Elgin Marbles) Restoration to Athens, Greece – Elgin Marbles Dispute Takes New Twist". Parthenonuk.com. 3 December 2004. Archived from the original on 26 July 2011. Retrieved 20 January 2009. ^ "News". New Acropolis Museum. Retrieved 29 December 2008. ^ "The Parthenon at Athens". www.goddess-athena.org. Retrieved 29 December 2008. ^ Brabant, Malcolm (10 November 2006). "Swede gives back Acropolis marble". BBC News Online. Retrieved 3 January 2010. ^ a b "Greece reclaims Parthenon sculpture from Germany". CBC News. 5 September 2006. Archived from the original on 27 May 2007. ^ "Parthenon Fragments Won't Go Back Home". Elginism. 1 April 2007. Archived from the original on 15 June 2009. Retrieved 20 January 2009. ^ "Bring Them Back". Retrieved 17 April 2010. ^ "The Lovely Stones". Retrieved 15 August 2016. ^ "A Modest Proposal". Retrieved 27 November 2014. ^ a b "Public and MPs would return the Elgin Marbles!". ipsos-mori.com. Archived from the original on 26 January 2013. ^ "Figure of a river-god from the west pediment of the Parthenon". britishmuseum.org. Retrieved 8 December 2014. ^ "Greek Statue Travels Again, but Not to Greece". www.nytimes.com. Retrieved 8 December 2014. The Acropolis of Athens is an ancient citadel located on a rocky outcrop above the city of Athens and contains the remains of several ancient buildings of great architectural and historic significance, the most famous being the Parthenon. The word acropolis is from the Greek words ἄκρον and πόλις. Although the term acropolis is generic and there are many other acropoleis in Greece, the significance of the Acropolis of Athens is such that it is commonly known as "The Acropolis" without qualification. During ancient times it was known also more properly as Cecropia, after the legendary serpent-man, Cecrops, the supposed first Athenian king. The Parthenon is a former temple on the Athenian Acropolis, Greece, dedicated to the goddess Athena, whom the people of Athens considered their patron. Construction began in 447 BC when the Athenian Empire was at the peak of its power. It was completed in 438 BC, although decoration of the building continued until 432 BC. It is the most important surviving building of Classical Greece, generally considered the zenith of the Doric order. Its decorative sculptures are considered some of the high points of Greek art. The Parthenon is regarded as an enduring symbol of Ancient Greece, Athenian democracy and Western civilization, and one of the world's greatest cultural monuments. To the Athenians who built it, the Parthenon and other Periclean monuments of the Acropolis were seen fundamentally as a celebration of Hellenic victory over the Persian invaders and as a thanksgiving to the gods for that victory. Thomas Bruce, 7th Earl of Elgin and 11th Earl of Kincardine was a Scottish nobleman, soldier, politician and diplomat, known primarily for the removal of marble sculptures from the Parthenon in Athens. Robert Neil MacGregor, is a British art historian and former museum director. He was the editor of the Burlington Magazine from 1981 to 1987, then Director of the National Gallery, London, from 1987 to 2002, Director of the British Museum from 2002 to 2015, and is currently the founding director of the Humboldt Forum in Berlin. Francesco Morosini was the Doge of Venice from 1688 to 1694, at the height of the Great Turkish War. He was a member of a famous noble Venetian family which produced several Doges and generals. He "dressed always in red from top to toe and never went into action without his cat beside him on the poop." Bassae is an archaeological site in Oichalia, a municipality in the northeastern part of Messenia, Greece. In classical antiquity, it was part of Arcadia. Bassae lies near the village of Skliros, northeast of Figaleia, south of Andritsaina and west of Megalopolis. It is famous for the well-preserved mid- to late-5th century BC Temple of Apollo Epicurius. Marbles Reunited: Friends of the British Committee for the Reunification of the Parthenon Marbles is a campaign group, governed by charter and funded by donations from members and supporters, which lobbies and raises awareness about the case for the return of the Parthenon (Elgin) marbles to Athens, Greece. Greek–British relations are foreign relations between Greece and the United Kingdom. The two countries have been allies during the First World War and the Second World War, but also Greece received military and financial assistance from the United Kingdom during the Greek War of Independence. Both countries currently maintain relations via the British Embassy in Athens and a consulate general in Thessaloniki and the Greek Embassy in London and honorary Greek consulates in Belfast, Edinburgh, Glasgow, Leeds and Gibraltar. Marie-Gabriel-Florent-Auguste de Choiseul-Gouffier, called Auguste de Choiseul-Gouffier, was a member of the Académie française and the Choiseul-Gouffier family, French ambassador to the Ottoman Empire from 1784 until the fall of the French monarchy and a scholar of ancient Greece. Stealing Athena is an historical novel by Karen Essex, which chronicles the journey of the controversial Elgin Marbles or Parthenon Sculptures from their home atop the Acropolis in Athens to the present location, The British Museum. The story is told in dual narratives from the points of view of Mary Nisbet, Countess of Elgin, who assisted her husband, British ambassador Lord Elgin, in removing the marbles, and Aspasia, mistress to Pericles, who witnessed the construction of the Parthenon. Published by Doubleday, June 2008. 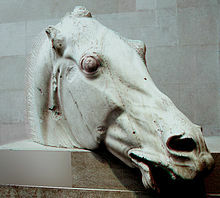 Imperial Spoils: The Curious Case of the Elgin Marbles is a 1987 book by Christopher Hitchens on the controversy surrounding the removal by Thomas Bruce of the Parthenon's sculptured friezes, and his subsequent sale of the Marbles to the British Museum. Hitchens examines the history of the artifacts and the question of whether they should be returned to Greece. The pediments of the Parthenon are the two sets of statues in Pentelic marble originally located on the east and west facades of the Parthenon on the Acropolis of Athens. They were likely made by several artists, including Agoracritos. The master builder was likely Phidias.